Book now the best shore excursions in Tangier. High quality and safety at the lowest prices. If your are looking for Shore Excursion Tangier, book now the best guided tours at lowest price with Ancora Tours. Since 2003 we offer you official guides in english, transportation and travel insurance, all included. The highest quality at the lowest rates. 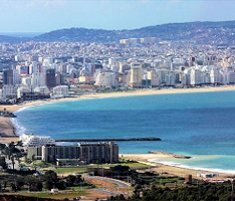 The Moroccan port city of Tangier sits on the Strait of Gibraltar, and its strategic position between Europe and Africa means many different cultures and civilisations have made their mark here. Lets explore the historic city together on a Tangiers shore excursion. What’s eating: A tagine is actually the clay cooking pot with a conical lid. Whichever stew is bubbling away in side is guaranteed to be delicious. Dress Code: Please note the dress code recommended to enter any mosque. A veil is needed for women to cover their head. No shorts, bare shoulders or miniskirts. This applies to both men and women. Comfortable walking shoes and sunscreen are recommended. From the harbour, our Tangier shore excursion first heads to Cape Spartel. From here, the most northwestern point of mainland Africa, we can enjoy spectacular views of the Atlantic and also visit the Caves of Hercules. Evidence of habitation in Neolithic times, dating back to 6,000 BC has been found in these caves. It is said that Hercules stayed also stayed here before his 11th labour of collecting golden apples. The Tangier shore excursion continues with a visit to the Kasbah and to the old town, known as the Medina. Here we can explore the narrow streets that are lined with traditional shops and stalls. Many specialise in leather goods, wooden handicrafts, silverwork or traditional Moroccan clothing. Finally, we’ll head to the Grand Souk, or Grand Socco. This square started life as a large marketplace filled with traders, snake charmers and musicians. In modern day Tangier, we can still see some traders but the Grand Souk has become much more. Seen as the heart of the city, it’s the place where old Tangier and new Tangier meet and where modern culture mixes with the historic. After the visit we return to the port in time for boarding. Note that: The excursion will not visit any shopping district.